Such wonderful hand made Murano glass beads! The focal beads that I have chosen for these new earrings are genuine Murano glass beads done in the shape of hearts! 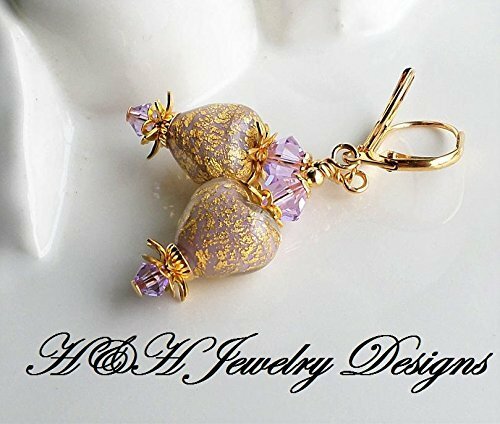 The beads are petite and measure just under 1/2 inch wide and long and feature a core of soft Violet purple accented with genuine 24 KT gold foil details. The beads are encased in a layer of clear Moretti glass helping to protect the colors and the gold. These are genuine Italian Murano Venetian glass beads. Above and below I have added matching Swarovski Crystals in Violet along with gold finished brass accents and ear wires in the lever back style. Total length is 1 3/4 inches.